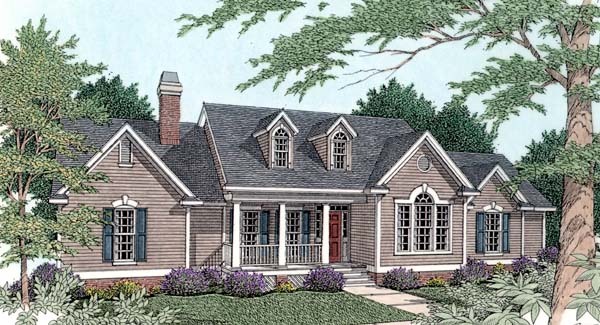 'A classic palladium window combined with the raised, covered porch gives this home an especially welcoming look. The foyer opens to the formal dining and living room. In the living room, a fireplace warms the lofty vaulted ceiling and a built-in television cabinet provides convenience. A brick paver rear porch and patio create great space for outdoor entertaining; the porch has triple skylights for added sunlight. The open kitchen joins the breakfast room with an island snack bar. The kitchen serves a pantry, cook top, microwave and oven cabinet, and plenty of storage and work space. The cozy master bedroom is privately located in its own rear wing. A vaulted ceiling and walk-in closet are provided; along with, the bath which includes plenty of linen cabinets, a whirlpool tub, and a stall shower with a glass block divider for additional privacy. Two additional bedrooms share a nice full bath. Question: Is there a pantry in the kitchen? Is there shelving built-ins on the left of the fireplace? Is there a counter and cabinets on the oppisite side of the washer and dryer? Is there any attic space for storage? Is there any cabinet space in the lower part of the island, opposite of the dishwasher I presume? I want to use the space of the shower and tub as a open door walk in shower only. Does that requjire a modification in the plans or is that done easily by the builder? Answer: Yes, There is a 3' pantry just before you enter the Formal Dining room. A built-in TV Cabinet is to the left of the fireplace. There is cabinets only (no counter) across from the washer & dryer. Attic space can be provided with an added pull-down attic stair. There is cabinet space in the island. And the walk-in shower could be completed on the job site by your contractor. But it may be necessary to make sure your local codes do not require the change to be made on the plan.